The gaming market is chock full of battle royale-style games, and it’s getting worse with each passing day. It’s not that there are too many of them for this particular genre, it’s just there are too many bad ones out there. The game that started it all is H1Z1, which was first released back in 2016. The hype behind H1Z1 is easy to see, the game had a lot going on for it, and it apparently still does. What began as a zombie survival game with H1Z1: King of the Kill, later on split into two titles with H1Z1: Just Survive. While the former retained its battle royale formula, the latter stuck with the zombie survival schtick. The development of the console was put on the backburner and it seemed that the full release of the iconic game would never see the light of day. Since the H1Z1: Battle Royale Open Beta has been available on PS4 since May it’s time to take a closer look at H1Z1. For those who are not familiar with the genre, battle royale pits 100 players against each other on one massive map. The players drop in find a zone and scourge for supplies. With the ‘safe zone’ on the map growing smaller as the players progress, each of the combatants are forced to fight to the death until only one survives. The game can also be played in duos, where players are able to pair up with other players or play in pairs of five. This makes it easier for those who do not know the other players to play as a team. The game is not as easy as it sounds, as the players do not get to choose where they drop, which is again what makes the game fun to play. Unlike other games, it is entirely possible for a player to succeed without finding any high-quality gear or weapons. That’s because the game is as much about survival as it is about combat, which means it’s perfectly normal to hide and wait till the other players take each other out rather than join the gunfight. Despite having years to develop the environment of the game, it still lacks in terms of looks. There’s also plenty of visual pop-in, from players clothes, to the objects and textures, so don’t be surprised if you end up staring at a headless naked person for a few seconds every time some other player decides to reveal themselves. This is also mostly due to the slow loading time which takes a while for the gear to follow the players around. Another issue with the game is that the color palette is completely washed out, which means you can still see remnants of its zombie survival past, which is on another game, H1Z1: Battle Royale comes as its advertised – as a battle royale and nothing more. The core gameplay being what it is also means that it won’t take long for players to find themselves running around in circles, but for some reason it doesn’t grow dull because there’s always something to do, whether its finding new gear or chasing down other players or being chased by other players. You could however, reach higher placement by just hiding out and staying within the boundaries of the safe zone, but now where’s the fun in that. 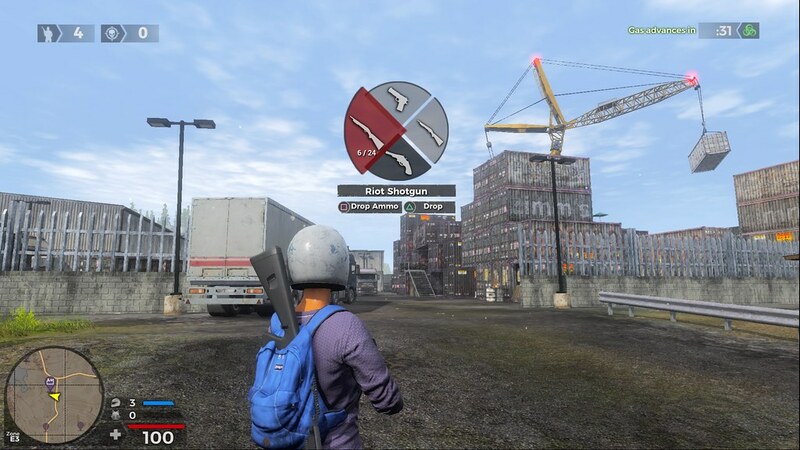 Each of the matches in H1Z1: Battle Royale lasts for up to 10 minutes give or take, with the first six of those minutes being agonizingly slow and quiet, with the match ending with either player getting a bullet to the head or the back, which seems to be the preferred spot to unload a weapon. While you won’t be finding any good weapons lying around rusting in the sun or stashed away in any old building, the best way to get your hands on a cool KH-43or a M40. However, there is better weapons in the military crates but the only problem is, those crates send a light beacon into the sky so you can bet that almost every other player left in the game will be racing to get their hands on high quality weapons, and you just might step in the sniper’s scope of some player who decided to camp out around the site. The good news is nothing in the game feels overly awkward or not in place. While other PC centered games that are eventually ported to gaming consoles usually suffer from menus and outputs that are initially designed for a keyboard and mouse, H1Z1: Battle Royale doesn’t seem to suffer from the same condition, which is a good thing. The main purpose of the player in H1Z1: Battle Royale is to customize the visualization of the player’s in-game character. Players are offered a battle pass with which they can get premium items as they level up. Despite, the add-ons all players seem to remain on an even playing field throughout the game. The game does seem to lack when it comes to rewards. H1Z1: Battle Royale Open Beta has been available on PS4 since May, there are also some updates that could change the gameplay for the better. Players can expect to find an ‘Arcade Mode’ which has been added to the new update, which also gets Shooties and Snipers mode as well. While the gameplay of H1Z1: Battle Royale will play out as normal, players are going to be restricted to using only sniper rifles and shotguns. Apart from that, new short-range, medium-range and long-range guns have also be included in the game, which will add a bit more flavor to the overall gameplay. As of now, no details have been released on the exact weapons that are going to be included in the game with this latest update. Players can also expect to see a ‘Daily Challenge’ system where new objectives can be set. While H1Z1: Battle Royale has received numerous updates since its initial launch, this has got to be one of the most anticipated updates to date. The new update will also remove some annoying bugs in the system.